On this page I put together a collection of acceleration problems to help you understand acceleration better. The required equations and background reading to solve these problems is given on the kinematics page. A horizontal turntable at an industrial plant is continuously fed parts into a slot (shown on the left). It then drops these parts into a basket (shown on the right). The turntable is rotating with a constant angular velocity w. There is negligible friction between the parts and slots. 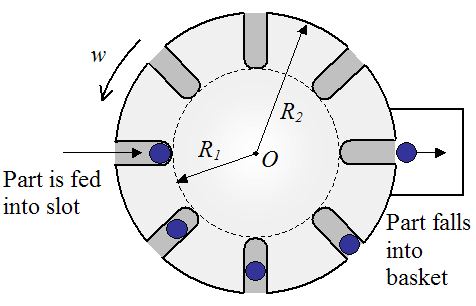 The parts exit the slots with a radial velocity Ve relative to the turntable. What is the acceleration of the parts at radius R1 and R2? The parts experience no radial acceleration because there is no force in the radial direction acting on the parts as they slide outward. There is no force because: 1) The turntable is horizontal and there is no gravity component in the radial direction, and 2) There is no friction between the parts and slots. Hence, the parts experience only Coriolis acceleration, perpendicular to the radial direction. Coriolis acceleration is given by 2Vrw, where Vr is the relative radial velocity. At radius R1, Vr = 0 since the parts are just beginning to slide. Therefore, the acceleration is zero at radius R1. At radius R2, Vr = Ve and the acceleration is 2Vew.